Be cheerful and tranquilly rest in the arms of Jesus and mitigate your fears with the greatest confidence in Jesus, as it is from him alone that you should expect many blessings. Gene Ricci wrote to us at Padre Pio Devotions about his visit to San Giovanni Rotondo in 1961. We corresponded a number of times with Gene and learned all the wonderful details of his story. When Gene Ricci read the book, The Priest who Bore the Wounds of Christ, by Oscar DeLiso, he was deeply inspired. 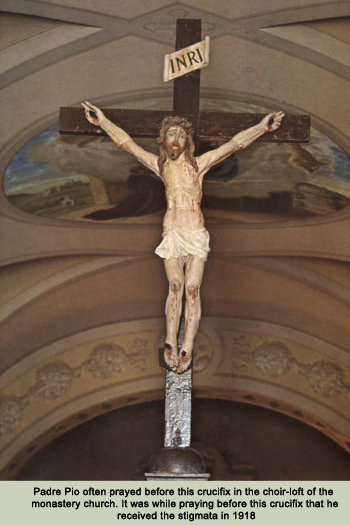 Gene learned that Padre Pio had the stigmata, the five wounds of Christ. He believed that what he had read in the book was true and he had a great desire to meet Padre Pio in person. He decided to take his family to Padre Pio’s monastery in San Giovanni Rotondo. The year was 1961. Gene had two sons and two daughters, ranging in age from five years to eleven years old. At the time, he did not have the financial means to make the trip so he borrowed the money. When he looked back on the experience, he said that it turned out to be the best investment he ever made in his life. No one with whom Gene was acquainted in his home town of Pittsburgh, Pennsylvania had ever heard Padre Pio’s name. That was hard for him to understand. If someone had the five wounds of Christ, it seemed to Gene that the whole world should know about it. When Gene and his family stopped in Rome on the way to San Giovanni Rotondo, he assumed that most of the Roman citizens would, at least, have heard of Padre Pio. Much to his surprise, not one person that he spoke to while in Rome knew anything of the saintly priest. The first day of their visit to San Giovanni Rotondo, Gene and his family waited in the early morning hours for the church of Our Lady of Grace to open. A few moments before the doors were unlocked, a booming voice came over a loudspeaker and said emphatically, “This is the Lord’s house. Everyone is to behave in a dignified and proper manner!” It struck Gene as a rather unusual announcement but soon he would understand the reason. When the doors finally opened, there was a mad rush on the part of those who were waiting to get inside the church as quickly as possible. Gene had to physically brace himself to protect his wife and his four children. He was afraid they might be trampled. Gene and his family found good seats near the front of the church but soon they were forced out of them by the local people. “These pews belong to us!” Gene was told. There was an obvious resentment toward anyone who had come from a distance to attend Padre Pio’s Mass. Gene and his family were shoved and pushed right out of their seats and forced to sit in a pew farther back. Padre Pio’s Mass lasted almost two hours. The Consecration was especially long. At the afternoon Benediction service that day, Gene noticed a beautiful perfume that seemed to pervade the whole church. Gene and his family attended Mass and Benediction every day during their visit to San Giovanni Rotondo. 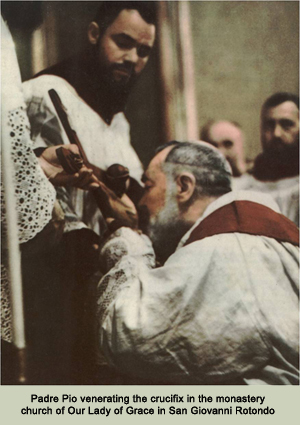 Every morning after Mass, Padre Pio went to the sacristy to make his thanksgiving. One day, Gene decided to follow him into the sacristy. Gene felt extremely lucky for he was able to kneel down right beside Padre Pio for the entire time that he made his thanksgiving. Gene could not resist the impulse to reach out and touch Padre Pio’s habit. He held on to his habit for the duration of the time that they were praying. Gene became friends with Mr. Bevilacqua, the owner of the hotel that he and his family stayed at while in San Giovanni Rotondo. Mr. Bevilacqua went to the monastery every day and was able to see Padre Pio during the lunch hour. After Gene returned to Pennsylvania, he arranged to send a donation to Padre Pio each month through Mr. Bevilacqua. On one occasion, when Gene sent his donation, he included a note saying that his wife was ill. The doctors could not determine what was wrong with her. Gene was worried and asked Mr. Bevilacqua to relay the message to Padre Pio. A short time later, Gene received a reply in the mail. Mr. Bevilacqua said that Padre Pio began to laugh when he was told about Mrs. Ricci’s illness. “Mrs. Ricci isn’t sick,” Padre Pio exclaimed. “She is expecting a baby!” The whole family was surprised to find out that Padre Pio’s words were correct. When Gene returned to his home in Pittsburgh, Pennsylvania, even though he could not really afford to do so, he bought fifty books by Oscar DeLiso, The Priest who Bore the Wounds of Christ. He mailed them to his friends and relatives with a card attached to each one, “Please read this book.” Gene began attending a Padre Pio prayer group in his area and enjoyed it very much. One of the members, Joe Peluso, was from a neighboring town. On one occasion, after the prayer meeting, Joe approached Gene and confided to him that he had terminal cancer. He did not have much time left to live. Joe told Gene that he had a number of Padre Pio’s relics and he wanted to give some of them to him. Gene was very surprised, since Joe was almost a stranger to him. He had seen him at the prayer meetings on occasion but did not really know him. Joe gave Gene a piece of the handkerchief that Padre Pio had used to dry his tears, a piece of his glove, and a medal blessed by both Padre Pio and Pope Pius XII. Joe explained that he had been in the U.S. Army when he was a young man and was stationed near San Giovanni Rotondo. He visited Padre Pio often and they became very close. On one occasion, Padre Pio told Joe that his supply of religious medals had diminished and asked him to see if he could find some for him. When Joe succeeded in obtaining a good quantity of medals, Padre Pio was very happy. Padre Pio blessed them and gave two of the blessed medals to Joe. Then Padre Pio asked for the two medals back. He prayed over them for a second time before returning them to Joe. He explained to Joe that he wanted to give them a special blessing. Gene was elated to receive the precious relics. The fact that Joe wanted Gene to have them was a blessing in itself. Gene was curious about the special blessing that had been given to the medal. He wondered why Padre Pio blessed it not once, but twice. He asked Joe about it. “What was the second blessing that was given by Padre Pio to this medal?” Gene inquired. “You know, I never asked,” Joe replied. The spiritual blessings that Gene received by visiting Padre Pio have lasted through the many years since. “My life would not be what it is today if I had not made the trip to San Giovanni Rotondo,” Gene said. His faith was strengthened by the encounter and it has remained strong. As Gene stated, visiting Padre Pio was the best investment he ever made in his life. “In the summer of 1958, I completed studies in canon law at the Urban University in Rome. After that, with another American Capuchin, Father Reynold Rynda, I went to San Giovanni Rotondo in Italy to visit Father Dominic Meyer, who was a secretary at the time to our confrere, Padre Pio. The Padre received bags of mail from around the world daily and was loved by many people. Father Dominic arranged that both of us should serve Mass for Padre Pio. It was Sunday morning, June 29, 1958, ten years before Padre Pio’s death. I clearly remember the experience of that day. The Mass, which was before the Second Vatican Council, was in Latin, and Padre Pio celebrated facing forward, where a large crucifix hung. His Mass that day, without a homily, lasted one hour. There were some periods of what might be described as raptures, when Padre Pio, with eyes open, seemed to be witnessing the events of the Upper Room and of Calvary. At the lavabo of the Mass, or the hand washing ceremony, I poured water over the sacred stigmata. In the sacristy, I kissed his hand. My family and extended family are from Italy and some of them knew Padre Pio. My grandfather, Cosmo Orlando, who was a farmer, remembered Padre Pio from the early days. He said that Padre Pio was always the one boy who acted as mediator when disputes arose among friends. My father was twelve-years-old when he moved to America. His mother took him to the monastery to say goodbye to Padre Pio. My father remembers vividly taking hold of Padre Pio’s hand when saying goodbye to him. In 1958, while on deck in a baseball contest, I was struck in the head with the bat from the player who had just struck out at the plate. I was eight-years-old at the time. I suffered a double skull fracture and underwent an eight hour operation. My life was in the hands of two wonderful neurosurgeons, Dr. Greenberg and Dr. Fromm. Although I survived the operation, Dr.Greenberg informed my mother that the prognosis was very dim. I would probably suffer permanent brain damage and thus a normal life was not likely. My grandfather, who had an undying belief in Padre Pio, possessed one of his gloves. It was placed on my forehead in the hospital. When I was released from the hospital, I continued my recuperation and a month later, I was able to return to school. After that, I never looked back, even though a plate was inserted in my head the following year. I remained under Dr. Greenberg’s care until I turned twenty-one years old. He always told my mother and me that he could not explain my recovery, especially since a part of my brain had to be removed from the left lobe. Dr. Greenberg used to say that someone else or something else assisted me. He concluded that my recovery was a medical miracle. My father retains the glove of Padre Pio to this day. Giuseppe Quaranta was born and raised in Bari, Italy. Giuseppe’s grandmother Anna, used to travel to the monastery of Our Lady of Grace to attend Padre Pio’s Mass and to make her confession to him. She told Giuseppe that Padre Pio’s voice was very gentle and sweet whenever he spoke to her in the confessional and she knew it was a great grace to make her confession to the saintly priest. Giuseppe’s Aunt Archangela make her confession to Padre Pio on one occasion only, when she was thirteen-years-old. It was not an easy experience for her. Confession was serious business to Padre Pio and he wasted no time but said to her, “You have a sin to confess and you have not mentioned it.” A feeling of fear came over Archangela and she started to tremble. She tried to think of a sin she had committed but she could not recall it. For a penance, he gave her ten Hail Mary’s to pray. “This is one tough priest,” Archangela said to herself. Padre Pio spoke with authority in the confessional and it proved to be intimidating to her. She returned to the monastery of Our Lady of Grace many times, but she never again had the courage to make her confession to Padre Pio. Giuseppe’s good friend and teacher used to take one of his relatives who was wheelchair-bound to Padre Pio’s monastery twice a month for the Wednesday morning blessing of the sick. The sick gathered faithfully every Wednesday both in the morning and in the afternoon to receive Padre Pio’s blessing. Giuseppe had grown up in the parish of St. Rocco in Bari. The Pastor, Father Domenico Labellarte, had a great devotion to Padre Pio. Once, he shared an interesting story with Giuseppe about a friar who was staying at the monastery of Our Lady of Grace. The friar was preparing for his ordination to the priesthood but he became very upset when he learned that he would have to take a fourth vow before receiving Holy Orders. He decided to ask Padre Pio’s advice. One day he found Padre Pio in the church, praying in front of the crucifix. He waited a long time for him to finish his prayers and finally he became impatient. He tapped Pade Pio on the shoulder but he did not respond. He was deeply immersed in prayer. He tapped him harder on the shoulder and spoke in a loud voice, “Padre Pio, I must speak to you!” This time Padre Pio looked up. “I am very upset,” the friar said, “and I need your advice. I will be ordained to the priesthood soon, and my superiors have now told me that in addition to my vows of poverty, chastity, and obedience, I am required to take a fourth vow, a vow against modernism. I don’t even know what modernism is and I feel very resentful about the new requirement. I do not want to take a fourth vow. Please explain anti-modernism to me and tell me what I should do. Padre Pio told the friar that his attitude was in error and he advised him to correct himself at once. “Just take the vow the Church requires of you and don’t question it,” Padre Pio said. “You need to follow the order of your superiors. Obey Holy Mother Church and do what your superiors tell you!” As usual, his words were simple and right to the point. When their conversation was over, Padre Pio once again returned to his prayers. Although Giuseppe never had the good fortune to meet Padre Pio, he was delighted when he was given a tape recording of his voice. When he played the recording, he was surprised to hear the dialect that Padre Pio spoke. In different parts of Italy, the dialects can be so different that the people from one region often cannot understand the Italian that is being spoken in another region. Near the urban areas, people speak in a dialect that is common to the well-educated and sophisticated members of society. Bari, the city where Giuseppe was raised, is only 70 miles from San Giovanni Rotondo. Giuseppe was able to understood Padre Pio’s words in full. Padre Pio spoke with an accent and in the dialect of country people – the farmers, the simple shepherds, and the day-laborers. Padre Pio lived all of his life as a poor man. He entered one of the poorest religious orders of the Church. His parents made great sacrifices so that he could have an education and he worked hard and did well in his academic studies. He had always been studious. He had taken a vow of poverty when he entered the priesthood and he identified totally with the Franciscan charism of simplicity and non-possession. The Poverello, St. Francis of Assisi, was his spiritual father and guide. It is hardly to be wondered at that Padre Pio spoke the dialect of the simple and hard-working people of southern Italy, those who lived close to the earth. “In order to avoid irreverence and imperfections in the house of God, in church, which the Divine Master calls the house of prayer, I exhort you in the Lord to practice the following: Enter the church in silence and with great respect…Among other pious considerations, remember that our soul is the temple of God and as such, we must keep it pure and spotless before God and his angels. . .Then take holy water and make the sign of the cross carefully and slowly. As soon as you are before God in the Blessed Sacrament, devoutly genuflect. Once you have found your place, kneel down and render the tribute of your presence and devotion to Jesus in the Blessed Sacrament. Confide all your needs to him along with those of others. Speak to him with filial abandonment, give free rein to your heart and give him complete freedom to work in you as he thinks best. When assisting at Holy Mass and the sacred functions, be very composed when standing up, kneeling down and sitting, and carry out every religious act with the greatest devotion. Be modest in your glances; don’t turn your head here and there to see who enters and leaves. Don’t laugh, out of reverence for this holy place and also out of respect for those who are near you. Try not to speak to anybody, except when charity or strict necessity requires this. . .
On leaving the church, you should be recollected and calm. First, take your leave of Jesus in the Blessed Sacrament. . .do no not leave him without asking for and having received his paternal blessing. Once you are outside the church, be as every follower of the Nazarene should be. Above all, be extremely modest in everything as this is the virtue which, more than any other, reveals the affections of the heart . . .You must be modest in speech, modest in laughter, modest in your bearing, modest in walking. . . Therefore, be humble of heart, circumspect in words, prudent in your resolutions. Always be sparing in your speech, assiduous in good reading, attentive in your work, modest in your conversation…As an example, always keep before your mind the Divine Master’s meekness, which according to the expression of the apostle to the Corinthians, is on a par with his gentleness. “I, Paul, exhort you, by the gentleness and meekness of Christ.” After so perfect a model, change all your external actions so that they are a faithful mirror revealing your interior sentiments. Never forget this Divine Model, Annita. Try to see a certain lovable majesty in his presence, a certain pleasant authority in his manner of speaking. . .a certain sweet serenity in his face. Imagine that extremely composed and sweet expression with which he drew the crowds, making them leave cities and castles, leading them to the mountains, the forests, to the solitude and to deserted beaches, totally forgetting food, drink and their domestic duties. This entry was posted in Media Library, Newsletter Archives by Editor. Bookmark the permalink.